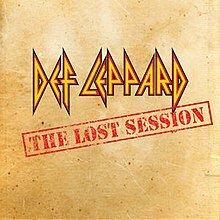 The iTunes exclusive concept dried up for Def Leppard afterwards, but in 2018 we got six more tracks, from a 2006 “lost session”. The rest of the songs don’t sound like “forgeries”, as the first ones did. These are listed on iTunes as “live”. They are not. They are also not meticulously recorded recreations. They lie somewhere between: not fully live, but raw in a way that Leppard rarely are. There are a number of surprises in the re-recordings. First and foremost: “Let It Go”! Any Leppard fan will tell you that the 1981 High N’ Dry LP is Leppard at their early, heavy best. While nothing can compete with the Mutt Lange produced original, the re-recording is still razor sharp. It gives you a chance to hear Phil Collen and Vivian Campbell on lead guitar. The pair do not attempt to imitate Pete Willis and Steve Clark, instead blazing their own trail. You don’t have to wait for the second surprise, a baffling one indeed: a re-recording of “Rock On” from 2006’s covers album Yeah! Why do Leppard keep playing this song? (It was even on their recent Best Of.) Considering how they’ve beaten this dead horse, it’s actually not much of a surprise after all. It was a boring song to start with, and Leppard can’t save it just by throwing down more guitars. “When Love and Hate Collide” is another surprising choice to re-record. The guitars are pretty incredible, but it’s just a ballad from a 1995 greatest hits CD. “Foolin'” from Pyromania is missing the atmosphere of the original, but otherwise hits all the notes. Joe Elliott still has an enviable voice. Then it’s “Promises” from Euphoria, their best song from a dreary era. Sure it’s a formulaic rewrite of their best hits rolled into one, but it works. This re-recording is closest in sound and spirit to the original (from 1999). Finally “Bringing On the Heartbreak” is a smokeshow as the closer. It’s hard to really call it a ballad; there is some heavy rocking here too. The guitars sound fabulous. Def Leppard may no longer be the band they were in the 80s, but Phil and Viv are two of the best players in the game. They don’t show off, so people rarely think of them when listing great guitarists. But they are. The outro solo (sounds like Vivian) nails it! 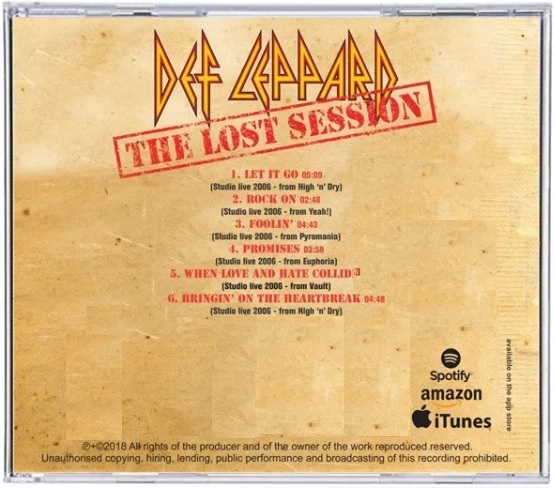 Def Leppard’s Lost Session is perfect for the fans who have it all. Re-recordings are almost always very dicey cash grabs. Leppard’s are worth the purchase. They’re not cheap knock-offs. New slants are fused with the old classics, so take these songs out for a fresh spin. Abbey Road ep they put out last year? A different set of recordings. But Abbey Road is superior because vinyl trumps mp3, obviously. Nice one Mike. I am always happy for anything new from Def Leppard even rehashes of old material. I want it all. Not this time but it IS a large part of the 2012 Acoustic Medley. They got ya covered! Friday I have Lep as well…. Rock On is such a turn off to buying anything on it… Leppard has so much other tracks whey do they keep plugging this track? Cool, I guess. I dunno I’m not a super-fan or anything so other versions of other versions of other versions… I dunno, I get lost on it. But if it sounds good, then I guess it was worth their effort! Nice description of Promises – it wasn’t earth-shatteringly original, but it works! It worked all the way into my grey matter!